Newer Spreader" Manure Spreader was developed as a low cost alternative to traditional manure spreaders for the small farm. The Newer Spreader was developed as a low cost, low maintenance alternative to traditional manure spreaders for the small farm owner. We have two units right now, the Model 100 is about 105 pounds empty and the Model 200 is about 115 pounds empty. Both units are 48" wide and can be pulled by hand easily and maneuvered in and out of stalls or paddocks. The Newer Spreader can be pulled with a small garden tractor, lawn mower, four-wheeler or golf cart. The aluminum and stainless steel construction will last a long time with little maintenance. The Newer Spreader is equipped with solid tractor tread tires so no more flats EVER! Our spring loaded front relief panel expands to allow for small rocks and sticks to pass through up to 1.5 inches around. How Do You Use The Newer Spreader? The Newer Spreader is so easy to use. Pull it to where you want to begin spreading, kick in the engagement levers (one on each wheel) and begin driving. The wheels will turn the drum and manure is crumbled and passed out the bottom in a path about three-foot wide and about ¼ of an inch thick. So easy. Crumbling the manure allows it to dry out faster and break down in a matter of days. The Newer Spreader is designed to spread manure, manure mixed with shavings, sawdust or pelleted beddings. Straw and large amounts of hay cannot be spread with the Newer Spreader. Small amounts of uneaten hay (about 10% of your load) will spread with no problem. The Newer Spreader will save you time and energy cleaning your stalls and dispensing the manure. You can eliminate pushing that wheelbarrow. Just think, no more huge manure piles that attract flies and create odor. Your horses can have a cleaner and healthier environment. There is a full year warranty on the Newer Spreader. Just give us a call if you have any questions or concerns, we are happy to assist you in any way we can. What Do People Have To Say About Newer Spreader? "The Newer Spreader is the greatest piece of equipment that has happened to my home ranch in many years. Once my staff used it, they wouldn't go back to anything else. It is simple and absolutely efficient in design and so user-friendly. Every person that owns a barn is cheating himself by not having the Newer Spreader. Genius! What more can I say?" What Do Other Customers Say About The Newer Spreader? "It took me 20 minutes to assemble it and I have used it EVERY day for over a full year. I haven't so much as had to tighten a bolt. It has worked absolutely flawlessly…"
" The Newer Spreader is wonderful – it saves time, my back, and my pasture. Great customer service…"
" Thank you for making my life enormously easier! The pasture grass thanks you too. It's a GREAT PRODUCT! Just wanted to let you know how much I like it!!.." " Our Newer Spreader arrived just a couple of weeks ago and I don't remember what we did before getting it. It is absolutely perfect for our small farm…"
" I have almost got the manure pile spread. Wouldn't trade it for another …"
" My wife and I just bought a Newer Spreader and we love it. It takes our horse's "production" and moves it, shreds it, where we need it. No fuss, no hassle. It works like your web site promised. Thanks for a great product!" "What an awesome product. We were impressed at how well it assembled and then totally impressed at how well it works…"
"We got our Newer Spreader, and retired the wheelbarrow. It is a lot easier to maneuver than the wheelbarrow even when loaded. The workmanship and quality of the product was far better than I was expecting. It works great for us. Thanks again.."
" We purchased a Newer Spreader from you all about two weeks ago. When we received it and we put it together (easy to comprehend instructions) and we love it, it makes cleaning stalls a pleasure. It's as handy as a pig with a pocket watch. Great invention!" " The design of your product is superlative as is the manufacturing and quality control. It has performed flawlessly for us. In fact when we have visitors, we often say, "Come see", and invite them for a spreading demonstration. What was a dreaded chore is now a happy chore. Thank you…." Order Your "Newer Spreader" Today! The Newer Spreader is so affordable and pays for itself in saved time and frustration! You can order from NewerSpreader.com or find us conveniently on Amazon.com! 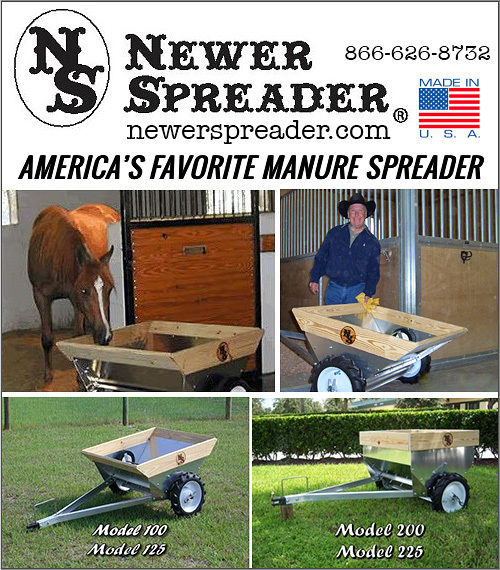 Now horse owners everywhere can enjoy all the benefits that Newer Spreader has to offer. Call us today or visit our website for secure ordering!